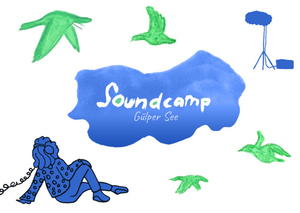 Soundcamp Gülper See is a collaborative listening and streaming event, what takes place from 02.-05. May 2019 in Brandenburg at the Gülper See. The camp introduces to the Gülper See by NABU excursion, workshops, listening sessions and hands on field recordings. Thousands of water birds are living at Gülper See. This gives dawn and dusk the unique opportunity to listen to the sound of the migration. We expect to hear cranes, white-fronted goose, lapwing, sedge warbler, golden plover, common snipe, water-snipe, oystercatcher, ruff, black-tailed godwit, curlew, redshank, corncrake, pintail, shoveler, and garganey. During the dawn chorus on 5 May we will live stream to soundtent.org followed by a public performance during the Open Gallery Day Brandenburg in the afternoon.